Need help finding help? Email us! Learning to operate in a new and unfamiliar environment is challenging, especially if you don't know who to ask or where to go for help. Here are campus resources that will help you make a smooth transition to life as a UNT student. Need to buy some books? Now that you have officially signed up for class, you'll need to buy your textbooks. A convenient place to get them is Barnes & Noble at UNT, on the first floor of the University Union. As a college student, you'll be spending a lot of time reading, studying and conducting research. The best places to do all of these activities start in the UNT Libraries. The libraries are the heart of learning and research at UNT. Library faculty and staff offer outstanding core services, provide leading-edge technology and support, and enhance the campus community with special events throughout the year. 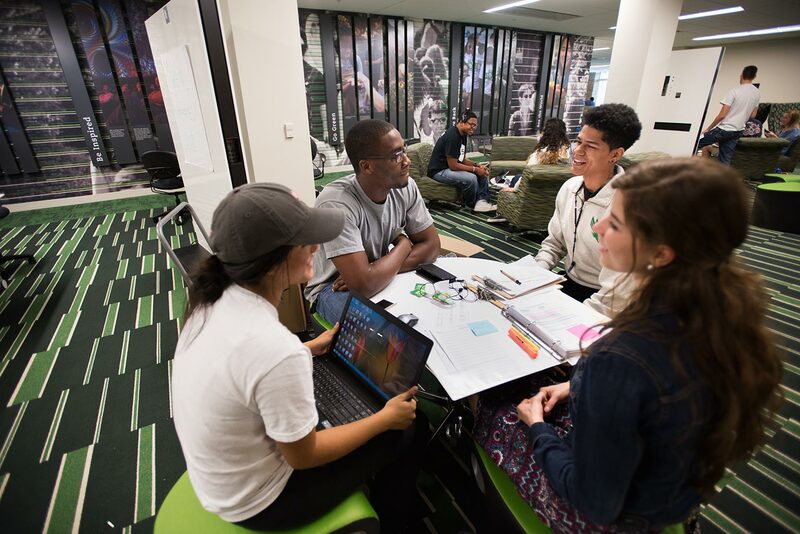 The libraries lead by providing open access to information and knowledge, showcase the scholarly and artistic works of UNT's faculty and staff, and help UNT's students succeed. Need to create and check your EagleConnect account? In order to get official UNT email messages regarding everything from bad weather notices via Eagle Alert to academic calendar updates, you'll need to log into your EagleConnect account. If you're on campus without your laptop and need to work on a paper, go online or check your EagleConnect account, you can visit any of UNT's computer labs. Here's a nightmare… You spent all night cramming to finish a 10-page paper for your American History class and there are only 45 minutes left until class starts when the paper is due. You start printing the paper and nothing happens. You could panic, or get help from the University Information Technology Helpdesk. Having computer trouble in your dorm? Here's another nightmare… You spent the whole weekend in your dorm room writing a 10-page paper for your English Lit class and there are only 45 minutes left until class starts when the paper is due. You just hit save but your document vanished. You could panic, or look for help from UNT's Residential Network. Need to register for classes? You've been accepted to UNT and your first order of business is to register as a new student. All registration is conducted online at my.unt.edu. You will need your EUID and password to register. If you need help, contact the Registrar's Office. Got to pay for classes? Once you've registered and selected your classes, you'll need to pay your tuition bill. Pay your bill in person at Student Accounting and Cashiering, on the first floor of the Eagle Student Services Center. What are the academic dates and deadlines that I need to know? The Academic Calendar can help you plan for mid terms, final exams, class registration, holidays and commencement. Want to take your education further? Study Abroad, located in Sage Hall, Room 236, will help you go experience the world. Call (940) 565-2207 to get more information. College life poses different challenges for students with disabilities. 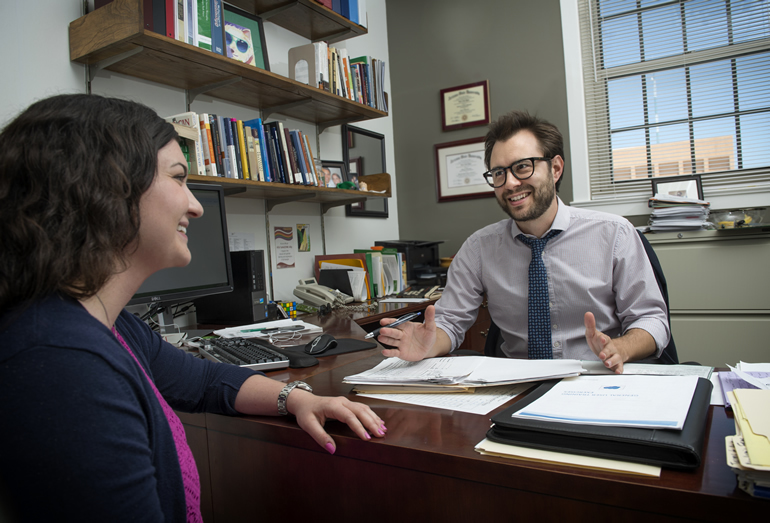 If you’ve been diagnosed with a learning difference such as dyslexia, or if you need a physical accommodation, the Office of Disability Access will make sure you receive the support you need to succeed at UNT. You can apply for services by visiting the office in Sage Hall, Suite 167 or by calling 940-565-4323, or find out if you qualify for services online. If you're having difficulties in 1000-2000 level math courses, the MathLab is available to help you. MathLab tutors can help with specific questions, help you get started on a problem, check that you're approaching a problem correctly and encourage you through the process as you tackle your homework. The MathLab is located in Sage Hall, Room 130. If you need help writing correctly, contact the Writing Center. The center provides an online service as well as maintaining office hours in Sage Hall Room 150. Questions can be submitted online and are usually answered within 24 hours. 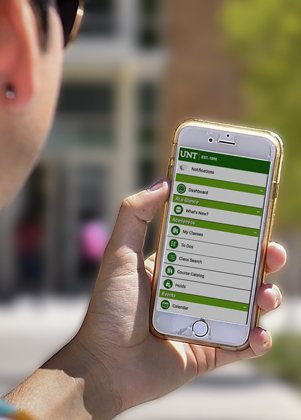 Keep all of your UNT needs in the palm of your hand with our mobile app. Follow @UNTEagleAlert to get notifications and real-time updates when there is a campus emergency. See the full UNT Calendar for more important dates and events. After hours of classroom work, studying or meetings, your brain needs refueling. 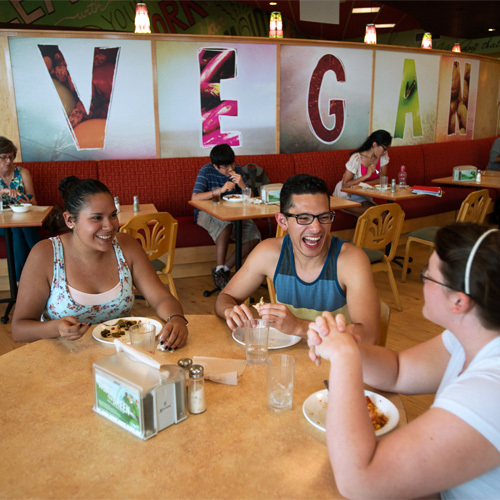 There are many campus options to meet your dining needs, with everything from light snacks to multi-course meals and choices ranging from vegan to Southern comfort foods. UNT's Dining Services helps to ensure that students have healthy, tasty and convenient food at almost any hour of the day, by providing five dining halls with various hours and different menus. During the summer, Bruceteria is the only residence hall cafeteria open. The new University Union has several Retail Food Shops, including many national brands such as Burger King, Chick-fil-A, Jamba Juice and Starbucks, just to name a few. If you have class in the vicinity of Wooten Hall and you find yourself in need of nutrition, you can purchase Peet's Coffee & Tea, cold drinks, baked desserts and light lunch items at The Go! Station. If you spend time at Discovery Park, check out Park Place Market where you can buy sandwiches, salads and bakery items, drinks and gourmet coffees. Or you can get a cup of coffee and a snack at Discovery Perks. Café G.A.B. in the General Academic Building offers a Caribou Coffee espresso bar, grab-and-go items, bagels and pastries. Khush Roti International Sandwiches serves a diverse selection of delicious sandwiches and side items near the GAB and Sycamore Hall. Biz Café serves Starbucks coffee and drinks, grab-and-go items and convenience store items in the Business Leadership Building. And if you need a little caffeine to perk up your Willis Library study session, visit The Study for coffee, tea, soft drinks and bakery items. There's never a dull moment on campus, if you know where to look. Whether you want to hang out with friends, are looking for entertainment for a date or want to help cheer the Mean Green to victory, you can always find something to do. If you want to learn what's happening on campus, your first stop is the official UNT Event Calendar. UNT's College of Music produces more than 1,000 performances during an average academic year, and many of them are free. To see what's coming up, check out the College of Music events calendar. For 114 years, the university's Fine Arts Series has brought a variety of programming to campus, including writers, artists, performers and speakers. 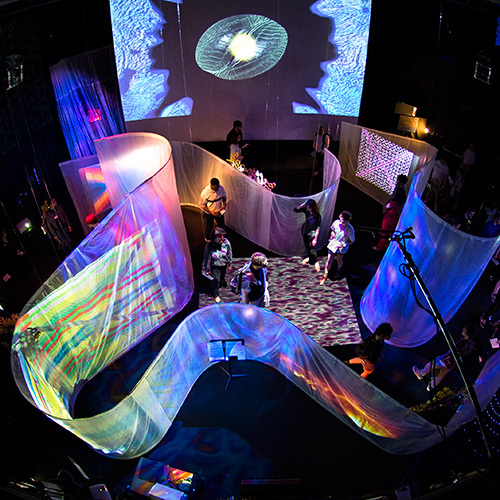 All Fine Arts Series events are free for current UNT students. UNT's Department of Dance and Theatre produces several theatre productions and choreographed dance performances each semester. Tickets are usually less than $10 for students. The University of North Texas Art Gallery, in the Art Building on the UNT campus. Cora Stafford Gallery, located in Oak Street Hall. Lightwell Gallery in the Art Building on the UNT campus. North Gallery in the Art Building on the UNT campus. KNTU 88.1FM is UNT's campus radio station. The station's main format is jazz, but KNTU also broadcasts UNT football and basketball games. North Texas Television is a nonprofit, student-run, cable access channel broadcast on Charter Cable 192 and Verizon Fios 46. The North Texas Daily is UNT's official student newspaper. NT Daily Radio broadcasts weekly online and also streams through DentonRadio.com. NTDaily TV is broadcast weekly in Spanish and English on the Denton Community Access Television channel, Charter Cable 25 and Verizon Fios 39. Looking for some peace and quiet? Opened in 2001, Goolsby Chapel provides the UNT community with a quiet place for self-reflection, meditation and individual worship for people of all faiths. The chapel, located on Maple Street also is available by appointment for small wedding ceremonies and other special events. Want to cheer for the Mean Green? 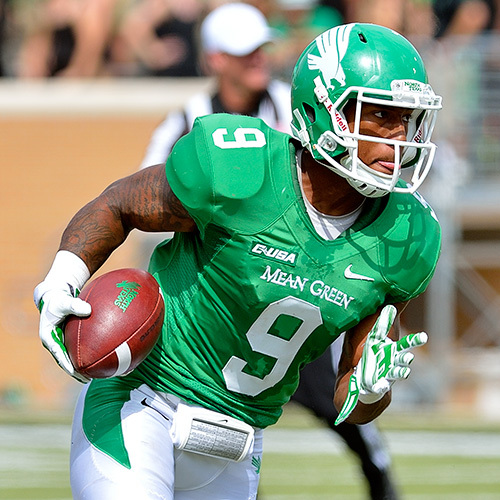 Don't miss all the excitement of Mean Green football this fall in UNT's Apogee Stadium. As a student, you can attend all games for free just by showing your student ID. Don't forget to wear your green gear. Want to get your game on? When you're in the mood to shoot a little pool, play video games or just kick back and watch the game, The Syndicate in the University Union provides all of the above. The Syndicate is a two-floor hang out location with a sports lounge feel. It hosts open mic nights, performances by bands and stand up comedians, watch parties for awards ceremonies, the Olympics, and the Super Bowl, and much more. Students can request to change the channels on the TVs, and all televised UNT Athletics events are shown in the Syndicate. UNT Jazz bands--and the famous One O'Clock Lab Band--play on the Syndicate stage several times a week. On the second level, you can check out free pool equipment for the pool tables and multiple TV lounges, where you can connect your game console or laptop to the screen and play games or watch TV and movies. Or maybe you participated in a specific sport in high school and want to keep playing now that you're in college. UNT has a wide range of Sport Clubs that you can join to keep up your skills. Whether you're worried about keeping off the famed freshman 15 pounds or want to get in better shape to stay healthy and happy, UNT provides several options to get you up and moving. The Recreational Sports Department provides programs, services, and facilities to support your recreational and fitness needs. The crown jewel of the Recreational Sports Department is the Pohl Recreation Center, located on Chestnut Street. Currently enrolled UNT students who have paid the Rec Fee are automatic members of the Pohl Recreation Center. A current UNT ID card is required for entrance to the Rec Center. UNT is an environment rich with diversity, bringing together different people with a vast array of ideas, philosophies, cultures and histories. So no matter what your walk of life is, there is probably a group that will welcome you and all the uniqueness you bring with you. Interested in learning about others? UNT's Multicultural Center is committed to cultivating a campus environment where people of all identities and experiences can thrive. The center fosters the success and awareness of historically underrepresented student populations with an emphasis on disability, race/ethnicity, gender, interfaith, and sexual orientation. Located in Room 335 of the University Union, the center offers programs and activities that are developed to increase awareness, understanding, and intersectionality of the various identities in the UNT community. 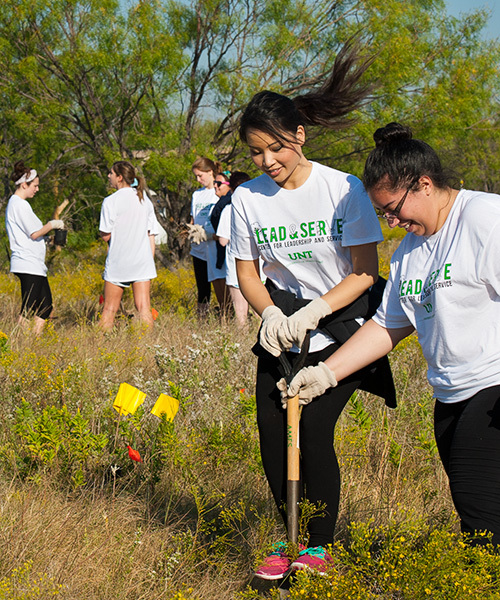 The Center for Leadership and Service develops learning opportunities for students to engage as active citizens and leaders in the community and provides volunteer and leadership development opportunities. Visit us in the University Union, Suite 345, to find your place on campus. The Student Government Association is a student organization dedicated to serving the interests of the student body. UNT recognizes the SGA as the official voice of the students. The SGA offices are located in the University Union, Room 344. The Talons, UNT's official spirit and tradition organization, keep the UNT spirit and traditions alive and thriving on campus. UNT's University Program Council is the university's only student-run programming board and is devoted to planning events for students that are educational, social, cultural and exciting. UPC coordinates a wide variety of events, from movie screenings to concerts. Want to know why we do what we do at UNT? As a new student, you'll understand more about UNT if you read about the university's history and learn how the traditions we observe today got started. Sooner or later, every college students needs more of one thing: money. UNT has resources that will help you earn more money and learn to use the money you have more wisely. The Money Management Center is an outreach program that provides tools and solutions students need to achieve financial freedom. The Money Management Center is located in Chestnut Hall, Suite 313. 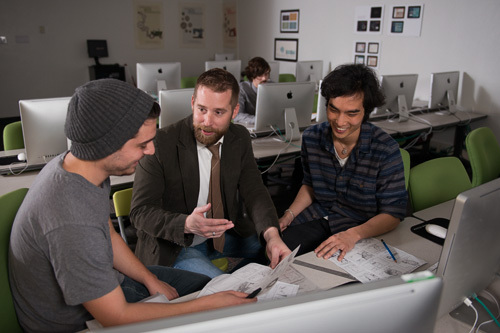 The Career Center helps students and alumni find employment during and after college. The center staff assists you with various aspects of your job search, from writing a resume and cover letter to interviewing, as well as providing many other job search tools. The Career Center is in Chestnut Hall, Suite 103. Figuring out how to pay for tuition, fees, housing and books is a challenge most college students face. Find out how to make ends meet through scholarships, grants and loans in the Office of Financial Aid and Scholarships, located on the second floor of the Eagle Student Services Center. If you're going out and need cash, there is a Wells Fargo ATM and full-service branch in the University Union. The branch is located on the first floor of the union in Room 222, from 8 a.m. to 5 p.m. Monday - Friday. Nothing is more discouraging than being in a new place and being unable to find your way. Bookmark UNT To Go, UNT's mobile site (m.unt.edu), on your smart phone to keep the university at your fingertips no matter where you go. UNT To Go includes Places, with an interactive map function. See more campus map options, including an option to print a campus map PDF. Wondering when the bus is coming? Visit the UNT Shuttle website to see shuttle schedules, routes and maps. Need a ride late at night? UNT's e-ride service is provided 7 days a week to all current students who need a ride to and from any place on the UNT campus between 9 p.m. and 2 a.m. Friday — Sunday. If you think you lost your sunglasses on campus but don't know where to begin looking for them, start at the information desk located on the 2nd floor of the University Union or search for them online using our new lost and found system powered by Crowdfind. Call them at 940-565-3805. Need to buy tickets or looking for a discount? Want to save a little money on your weekend activities? Now UNT students can purchase tickets at discounted rates and get discounts at local businesses by logging in to the UNT Perks page. You've just finished a Power Point presentation for your economics class and you need to make copies of the presentation for each of your class mates. Now what? Eagle Images provides full digital printing and bindery services for a great value. They are located in the University Services Building, Room 124. Design Works sends and receives public faxes. Prices vary, depending on whether the fax is sent locally, toll free, long distance, out of the country, or if it is an incoming fax. The center is located in the University Union, Room 223. Need to send a letter back home? UNT's Eagle Post is located on the first floor of the University Union, Room 112. Was it last night's all-night study session that has you feeling lousy or is it the flu? Get checked out at the Student Health and Wellness Center before you start feeling worse. If you're feeling good and working to stay healthy, the center is committed to helping you reach that goal. Medical visits are by appointment only. To schedule an appointment, call 940-565-2333. A student ID card is required at check-in. The center takes credit cards, check or cash for payment, though consultations with general practitioners are covered by the Medical Services Fee. The Student Health and Wellness Center ONLY files medical insurance claims for the university endorsed student insurance policy underwritten by United Healthcare Student Resources. The Student Health and Wellness Center is located on the second floor of Chestnut Hall and the UNT Pharmacy is located on the first floor of Chestnut Hall. Other health services available in Chestnut Hall include health education office in Suite 301, College Optical Express in Suite 101 and the Campus Smiles dental office in Suite 154. The Substance Abuse Resource Center helps students with existing issues regarding drug and alcohol use also works to create a safer campus atmosphere. The center is on the third floor of Chestnut Hall, Suite 301. Call 940-565-2787 to schedule an appointment. No referral is required. In addition, the Collegiate Recovery Program in Chilton Hall provides support and a variety of services for students who are in recovery. Feeling depressed or stressed out? The Counseling Center is part of Counseling and Testing Services, in Suite 311, Chestnut Hall. Summer hours are Monday - Friday, 8 a.m. - 5 p.m. until, Aug. 24. Fall hours are Monday and Tuesday, 8 a.m. - 8 p.m. and Wednesday - Friday, 8 a.m. - 5 p.m. In an emergency situation, your first call should be 911. 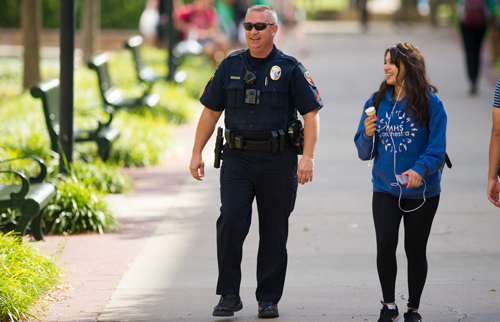 A dispatcher will send emergency personnel, and if the incident is happening on the UNT campus, that probably will include officers from the UNT Police Department, in the Sullivant Public Safety Center, department also can assist you in cases of property theft or destruction and other crime investigation, if the incident took place on the UNT campus. For incidents that happen in Denton beyond the UNT campus boundaries, contact the Denton Police Department. For incidents that happen beyond the Denton city limits but within Denton County, contact the Denton County Sheriff's Department. What if the university closes for bad weather? 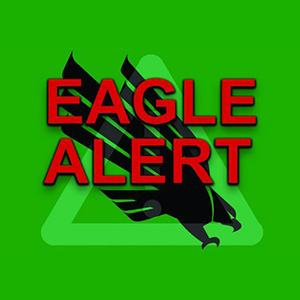 Eagle Alert is UNT's emergency notification system to quickly give you critical information in an emergency. The system allows administrators and emergency preparedness staff to quickly notify the campus community about weather alerts, campus closings due to weather or public safety emergencies. If there is an emergency, you will receive an automated call or text to the preferred phone number you provide at my.unt.edu. Be sure your contact information is up to date by going to my.unt.edu. Log in using your EUID and password, go to "Update Eagle Alert" and follow the instructions. In addition to sending Eagle Alert messages, the university will notify the campus telephone operators, post information on the UNT website and the UNT Facebook page and begin informing news media about closures. You also can follow @UNTEagleAlert on Twitter for real-time updates in an emergency. If you are facing a legal problem, Student Legal Services may be able to help you with many types of cases. Staff members may write letters, draft legal documents, represent students, arrange for mediation or otherwise attempt to resolve legal problems. While general legal advice may be available, Student Legal Services does not represent students in criminal matters (including traffic tickets). Student Legal Services is located in the University Union, Room 411.